Jamie joined Share the Road is 2013 and worked as the Youth Education Manager until stepping into the role of Executive Director in December 2014. Jamie has cycled for fun and for transportation since elementary school, but her real passion for getting around on two wheels began with a bike trip between Ottawa and Kingston while pursuing her undergraduate degree at Queen's University. Since then, she has completed a Master's thesis exploring people's motivations for cycling, worked as a School Travel Planning Facilitator in Ottawa and coordinated Ottawa's Bike to Work Month with EnviroCentre. Jamie is a resident of Ottawa and a new home owner in the Vanier neighbourhood. The objective of this presentation is to update delegates on Share the Road's advocacy efforts at the provincial level and the programs and policies that exist to support municipal work. This will include a report back from the 9th Annual Ontario Bike Summit, the results of our 2016 Stakeholder Survey, a status update on CycleON Action Plan 1.0 and our advocacy campaign to see a $50 million investment in cycling infrastructure in 2017. Share the Road will also take this opportunity to share new resources available to municipalities to raise awareness of the 1m safe passing law and update delegates on the work we are doing to see more youth trained through CAN-BIKE courses. Chantal has been working at the Eastern Ontario Health Unit since 2006 and worked as a Public Health Promoter until taking on the role of Health Promotion Specialist where she focuses primarily on providing expert advice and consultation to partners and stakeholders on issues related to improving access to physical activity – including working to build capacity in Cornwall, SDG and PR to create bicycle and pedestrian-friendly communities. Chantal has always been a passionate advocate of all things physical activity and she believes in the power of making the right connections to get things done. She is known for being persistent in her pursuit of getting people engaged. She has extensive experience working with partners at the local, provincial and national level and she feels fortunate to be able to have access to a strong network of professionals to work with and learn from. Her areas of expertise include public speaking, facilitating strategic planning and community engagement sessions, and project planning and evaluation. Danielle has spent the last 19 years working in Public Health. The majority of this time she has spent working on the topics of Physical Activity, Healthy Bodies/Healthy Minds and Healthy Eating. She has worked on trails promotion for the Tri–County. She also works with schools and communities in the Mississippi Mills, Carleton Place and Beckwith area for the majority of this time and has been able to build many positive relationships within these communities. She led the School Travel Planning (STP) process for the Naismith Public School STP group in Almonte as one of the two original pilot sites in Leeds Grenville and Lanark. Since then it has grown to include all of Almonte schools. 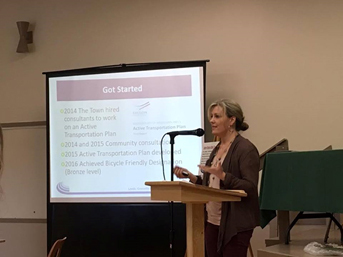 She has also been working on the Active Transportation in Mississippi Mills and is now on the Active Transportation Advisory Group for Mississippi Mills since its inception in 2016 and has been working with them on implementing their Active Transportation Plan. Danielle and Chantal work within their respective communities and work on their local Active Transportation Committees. Each of these communities has chosen a different type of Active Transportation Group. Chantal will share how in the Cornwall area their Active Transportation action group came to be. How they started, how their strategic plan was developed, how the group is structured and how it’s not a committee of council, who’s involved, strategies they’ve used to engage key stakeholders. Danielle will share how the group in Mississippi Mills got started, how the Active Transportation Plan was developed, How the Active Transportation Advisory of Council was established, who is involved and what it has achieved so far. They will share the pros and cons of their groups and lessons learned so far. A group of Public Health staff from Health Unit’s in Eastern Ontario Region identified some unique issues that we face when it comes to working on active transportation. They saw a need to collaborate and share lessons learned, resources and expertise. 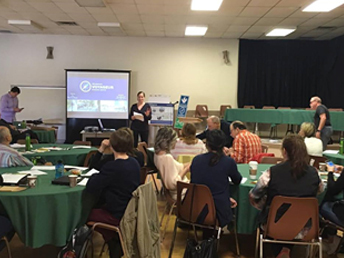 They have gotten together with Share the road to come up with a plan of how to create a network of all key players in active transportation in Eastern Ontario. They will share the Draft Terms of Reference for this group and offer on opportunity during the Open Conversations to provide feedback, discuss this network and come up with a plan to move forward. Judi is a long-time advocate for responsible environmental choices and has worked in the nonprofit sector for over 20 years, including EnviroCentre, a leading active transportation organisation in Ottawa. She is also a former small business owner who ran Ottawa’s first eco-café, caterer and cooking school for 6 years. Judi has worked for many national organisations, specialising in vulnerable populations as well as health care and transportation. She has lived overseas with her family in several high cycling nations including Vietnam and Hungary. She is active in her community on food insecurity issues, as a co-founder of the Deep Roots Food Hub. Judi considers herself a cautious every day bike user. She is based in Ottawa, where she lives with her husband, 3 children, a dog, a cat and 9 hens. Judi will share an overview of Canada Bikes. Canada Bikes Mission is to encourage Canadian residents and visitors of all ages to cycle more often for transportation, recreation and touring by making cycling attractive, safe, accessible and convenient across the country. The mandate of this group is to significantly increase cycling infrastructure and ridership across Canada by providing a strong national presence and a reasoned voice for cycling. Senior Associate Engineer/Planner, Alta Planning + Design, Inc.
Kate Whitfield launched an Ontario office of Alta Planning + Design in February. She is a Professional Planner and Professional Engineer with over 10 years in the consulting firm industry in the Ottawa area. Alta is an international consulting firm with a mission to create more active, healthy, and people-focused communities. Founded in 1996, Alta has more than 200 staff in 30 offices across North America. Coupled with our passion for active transportation, Alta’s thorough understanding of the principles of bicycle and pedestrian design allows the firm to offer flexible and innovative design, planning, and engineering solutions. Alta, in partnership with the Federal Highway Administration, recently released the new Small Town and Rural Multimodal Networks guide. The guide fulfills the need and desire to make travel safer and more active in small and rural communities. The guide’s visualizations and flexible design guidance provides solutions for contemporary walking and biking facilities not addressed in guides such as the NACTO Street Design Guide and ITE Walkable Urban Thoroughfares report. The document’s compelling photographs, visual illustrations, and technical diagrams communicate design issues and solutions in a smaller scale setting. A representative case study, telling the story of a small community’s success at implementing multimodal facilities in a non-urban context, is paired with the design guidance for each facility type. A landscape architect, Jonathan has worked in the international field of active transportation and recreation for the fifteen years. His professional focus is on the design of sustainable cities including active transportation facilities and plans that are implementable and ecologically-responsive. Working from WSP’s Ottawa office, some of Jonathan’s recent Eastern Ontario projects include the delivery of an Integrated Community Trails Strategy for the Municipality of North Grenville, trails projects for the National Capital Commission and City of Ottawa, and the design of the City of Kingston’s off-road connections of the K&P Trail connecting the City’s waterfront and on-road cycling network. The amalgamated network is a symbolic celebration of Canada’s Sesquicentennial that connects Kingston to the K&P and Trans-Canada Trail. Jonathan will share an overview of today’s best practices and ideas on how to develop a successful and implementable Active Transportation Master Plan (ATMP). Brendan has revolved the greater part of his life around cycling. Starting as an aspiring professional mountain biker and turning to coaching when he realized 'those who can't do, teach'. In between those years, he also managed a bicycle store and guided army cadets through the foothills of Alberta on mountain bikes. 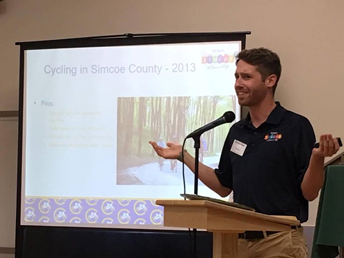 Most recently, Brendan has worked with the Barrie Cycling Club, developing a cycling tourism strategy for the County of Simcoe and has turned that into a full time role at Tourism Simcoe County. In his spare time he’s buying bikes, hiding new bikes from his partner and taking up international travel writing when the opportunity strikes. Brendan will be telling the story of how their tourism strategy was developed with a focus on developing partnerships, building on already existing tourism assets and creating an economic driver for Simcoe County. 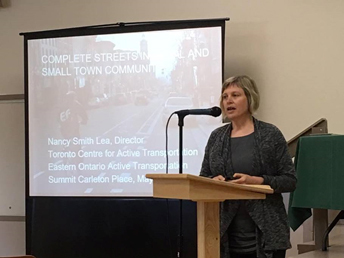 Nancy Smith Lea is the Director of the Toronto Centre for Active Transportation, a project of the registered charity Clean Air Partnership. Nancy has specialized knowledge in applied research and policy analysis specific to Complete Streets, safe and inclusive streets for walking and cycling. She has published several articles and led numerous research projects aimed at improving understanding and conditions for active transportation. In 2011, Nancy was awarded the Toronto Foundation’s Vital People grant for “Putting Active Transportation on the map”. In 2016 she was featured in Spacing magazine as a “Safer Streets Crusader” and one of 12 extraordinary women city builders. Complete Streets are designed for all ages, abilities and modes of travel where safe and comfortable access for pedestrians and cyclists is an integral planning feature. While Complete Streets are a goal for most Ontario municipalities, large and small, urban and rural, their characteristics and challenges are different depending on the context. This presentation describes the unique challenges and innovative solutions in Ontario rural and small town settings for improving conditions for walking and cycling. Funded by the Places to Grow Implementation Fund, this examination of best practice for active transportation beyond the Greenbelt was released in March 2017 in an e-book format with limited print edition copies. The book includes 13 case studies featuring active transportation policies and projects in municipalities outside of the continuous built-up areas of the Greater Toronto and Hamilton Area. TCAT's goal is to inspire Ontario municipalities, large and small, to create complete communities that enable active transportation. In 2016 Adam started his own business - The Brake Room. Part Bike Shop, Part Cafe, all community building space. He is born and raised in the Belleville area, and has a deep love for the region. He sees the importance of offering people multiple points of entry to cycling, and he understands the value that cycling brings to a community. Adam will be talking about the perspective of next generation entrepreneurs. As someone in his 20s who owns his own business, Adam is exactly the kind of person that communities in Eastern Ontario want to attract. They live, work and play in the community, and Adam's experiences in Belleville can certainly be instructive for other communities. "The Brake Room" is a great place for people to come and have a great coffee and a great conversation, and also learn a bit about cycling in the region too. Hans supports Mobycon's North American partnership and engagement efforts. Mobycon is a consultancy company in the field of mobility. The company is based in the Netherlands and Ottawa. Hans was born and raised in the Netherlands and came to Canada in 1998. Prior to joining Mobycon, Hans worked at the Netherlands Embassy in Ottawa, Canada for 13 years. In this role, he supported bilateral business initiatives and events and engaged with stakeholders in the Netherlands and Canada. Concerned about the lack of progress in cycling safety, in 2009 Hans joined Ottawa's local cycling advocacy group. In his role as president, he transformed Citizens for Safe Cycling-Bike Ottawa into a highly effective, well respected, community driven group. Prior to his involvement in cycling, he was approached by the National Capital Commission for support from the Dutch embassy to improve cycling conditions. A skilled presenter, Hans has delivered many successful presentations across Canada about cycling as a mobility solution. He was awarded the Bruce Timmermans Award, the Mayor of Ottawa's City Builder Award, the Service to the City Award and the prestigious Governor General’s Sovereign Medal for Volunteering for his advocacy work in active transportation. In 2017 he joined Mobycon. The Netherlands is more than the photos we usually see from Amsterdam and other bigger Dutch cities. There are hundreds of smaller towns and villages with bike modal shares of over 20%. Did you know, based on the 7.5 km cut off (most people cycle trips are less than 7.5 km or half an hour), that the Netherlands has 135 municipalities with higher bike modal shares than Copenhagen? And another 100 or so that come close to that number? Today, Hans will take us back to his home town in the Netherlands, going back to the early 1900's, sharing photos of the Main Street transformation to a Modernist car friendly street in the 60's, addressing the government mandated growth in the 1990's, and ending with a view from his parents balcony over mid rise, bike friendly developments, where the car takes a back seat and the town centre is lively, attracting people from outside town for the pedestrian friendly core. Justin joined Share the Road in 2013, and has overseen the growth of the Bicycle Friendly Ontario Program ever since. Throughout his teens and early adulthood, Justin never rode a bike. It wasn’t until the summer of 2007, while completing his Master’s at the University of Toronto, that he decided to get back on his bike to explore the City. Since that first ride, Justin’s love affair with all things two-wheeled has been constantly gathering speed. He sees the bicycle as a tool for developing healthier, better connected and more prosperous places, and loves working with stakeholders to make their communities more bikeable and livable. Justin has a passion for pragmatic advocacy – working together to find common solutions is what drew him to Share the Road. His areas of expertise include project management, oral and written communication and project facilitation. The Bicycle Friendly Communities Workshop is designed to encourage the stakeholders that know the community the best - the ones who live, work and play there every day, to help shape the future of cycling in their community. Through guided activities, attendees will be inspired by stories of communities that share things in common with the communities of Lanark County, will map out existing community assets and will create a plan to make the community a better place to ride a bike in the near future. The workshop is a fully interactive session - the workplan that will be created as a result of the workshop depends on the insight of the attendees. The more stakeholders and voices that are represented, the stronger the workplan will be and the more likely it will be to succeed. As a key stakeholder in the development and promotion of active transportation within Lanark County, your attendance is important to help develop a realistic, achievable workplan. We hope to see you there! Jennifer McCourt has been the Executive Director of Discovery Routes Trails Organization since 2006. Based in North Bay, Ontario, the organization has been coordinating the development of recreational trails across Northeastern Ontario with special focus on connecting communities through trails like the Trans Canada Trail. In 2013, Discovery Routes began in earnest to expand the trails network to include the designation of on-road cycling routes which led to the development of the Voyageur Cycling Route. The Véloroute Voyageur Cycling Route is Ontario’s next major cycling tourism experience spanning over 630km from Sudbury to the National Capital Region. Following the path of the Voyageurs over 400 years ago along four heritage waterways and 200km of the Trans Canada Trail, the Route celebrates a national significance experienced at a human-powered pace. With funding support from the Ontario Trillium Foundation, Discovery Routes will work in partnership with the Ottawa Valley Cycling and Active Transportation Alliance and Eastern Ontario Active Transportation Network Partners to coordinate the expansion of the Voyageur Cycling Route through Renfrew and Lanark counties. The purpose of the meeting will be to learn more about the Voyageur Cycling Route, establish a Southeast Expansion Steering Committee, and consult with stakeholders to determine preferred cycling route alignment between Mattawa and Ottawa through Renfrew and Lanark counties.